"If Jesus calls us to love our enemies, what does it mean to love those white supremacists in Charlottesville?" Over on Facebook, Dennis Sanders asked: "So if Jesus calls us to love our enemies, what does it mean to love those supremacists in Charlottesville?" Love doesn't mean endorsement or indulgence. It means standing firm on God's Word for the sake of others. It means calling people to repentance and new life through Jesus. It means praying that those who hate will be transformed by grace through faith in Christ. It means inviting those who hate to join the rest of we recovering sinners who make up the Church in laying our sins at the foot of Christ's cross and submitting to the Holy Spirit's project of making us new. ...a day late...to the Disneyland Haunted Mansion. I've never been to Disneyland. But I have been to the Disneyworld Haunted Mansion in Orlando several times. It's fun. Though the Haunted Mansion was not opened until two and a half years after Walt's death, a haunted house was one of the earliest ideas Walt had for his Park. In 1951, when Walt planned to build Mickey Mouse Park near the Burbank studio [Disney realized that the proposed site was going to be too small], he assigned conceptual artist Harper Goff to prepare drawings of a..."ghost house." Eventually, the walk-through concept for the attraction was abandoned and it became one of the most successful dark rides, including loading guests in cars that take them through ail the spooky doings in a New Orleans-style mansion that appears to the very definition of respectability on the outside, but is full of ghosts and ghouls and cornball humor on the inside. I enjoy this attraction for its humor as well as for the audioanimatronix. Happy belated anniversary to the Haunted Mansion. Thanks to my daughter for linking to this video on Facebook. "I like presidents who had campaign managers that didn't have their homes raided." As pointed out by blogger Ann Althouse, the phrase in the headline above is the most recomended reaction in the comments section to the New York Times account of the FBI's pre-dawn raid of ex-Trump presidential campaign manager Paul Manafort's home in the pre-dawn errors of July 26. “He’s not a war hero...He was a war hero because he was captured. I like people who weren’t captured." McCain was a hero, of course, incurring many beatings and tortures, the scars from which he still wears. Those beatings and tortures came because he refused to be used for North Vietnamese propaganda or to accept early release POW camp by appearing in such films. He knew that the North wanted to use him as a propaganda bludgeon on his father, Admiral John S. McCain, Jr. And to weaken the morale of POWs he would have left behind had he taken the offered ticket home once the propaganda film was in the can. For the sake of his country and his refusal to accept the preferential treatment he might receive as an Admiral's son, McCain is a hero! The reader comment on the Manafort story gives Trump a tweak for the disdainful comments made about McCain. In the meantime, McCain continues to be afforded insulting behavior by his fellow Republicans. Senator Ron Johnson seemed to suggest the other day McCain voted against the Senator Mitch McConnell-engineered health care reform bill because of McCain's recent brain diagnosis and the Arizona Republican was tired. I hope that Johnson apologizes to McCain. Today, during the second day of the Braaten-Benne Lectures (part of the North American Lutheran Church's annual Lutheran Week), Dr. Gordon Isaac talked about what Martin Luther said made a person a good theologian. Isaac emphasized that literally everyone is a theologian. Everyone has to decide what they believe about God. The only question is whether they're good or bad theologians. Luther insisted that these were the indispensable qualifiers for good theologians, people who know God and can articulate God's truth, not as an abstraction, but out of intimate knowledge of the God, Who when He took on flesh in Jesus said of Himself, "I am the way, and the truth, and the life" (John 14:6). Luther's qualifiers for good theologians ring true to me. As in any relationship, time is essential. People who say that their relationships are built on quality time, if not on quantity of time, don't know much about relationships. As someone has said, love is spelled T-I-M-E. These are the ways in which we become good theologians. Through prayer, meditation, and spiritual trials, we learn that when we come to the ends of ourselves, God is still there. We learn that when nothing in this world makes sense, God makes sense. We learn that when we are weak, vulnerable, and incapable of going on, the time we spend with God in prayer, meditation, and spiritual trials, yields deeper faith and good theology. It's only when we endure Good Friday times with God that we experience Easter Days with Him. And it's how anyone who dares can become a good theologian. As Luther would say, "This is most certainly true." 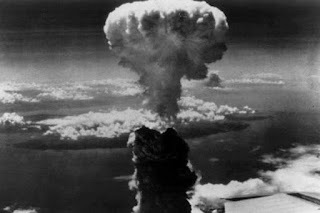 Pictured above, at the top, is the mushroom cloud arising from the atomic bomb dropped at Hiroshima, Japan on August 6, 1945. 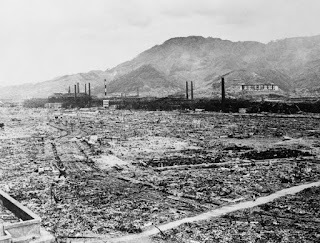 Below it, is a picture of what was left of Nagasaki after the second bomb was dropped on Nagasaki three days later. 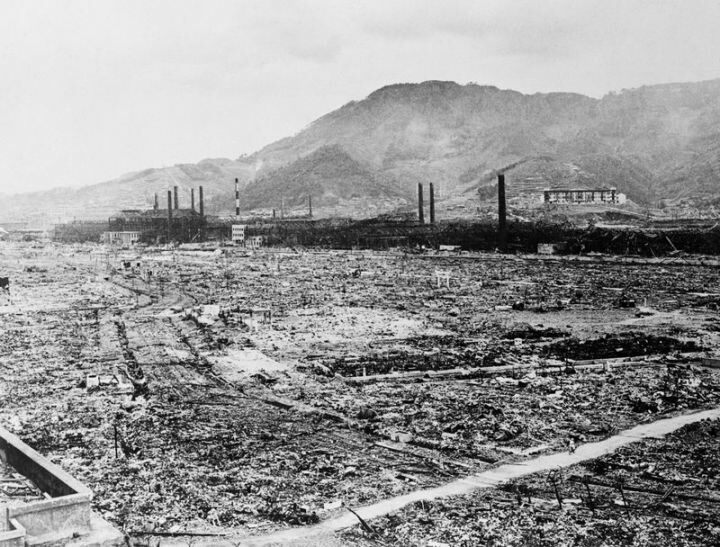 President Truman believed that the bombs needed to be dropped in order to force Imperial Japan to surrender, avoiding the death of tens of thousands of Americans and others. I've always believed he was right. But it cannot be easily dismissed that at least 129,000 died as a result of the bombings. It was the worst humanly-produced conflagration in history. That fact made the current president's statement earlier today regarding North Korea's apparent development of miniature nuclear weapons that can be projected via ICBMs. He promised that if North Korea didn't back down from its nuclear weapons program, it "will be met with fire, fury and frankly power the likes of which this world has never seen before." Never been seen before? Does that anticipate a use of force that is bigger than Hiroshima and Nagasaki? North Korea's regime needs to be dealt with and restricted. But I pray that doing so won't require anything like Hiroshima and Nagasaki. 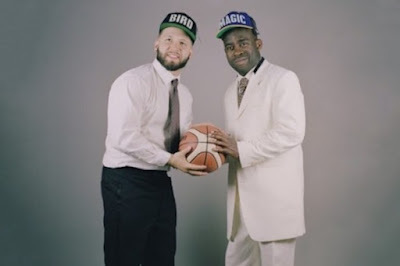 Another from the new release, Magic & Bird by Andy Mineo and Wordsplayed. If you like rap, check out the just-released collaboration of Andy Mineo and Wordsplayed, Magic & Bird. I've liked Mineo a lot for a while now. This is an interesting release. It's one of two new LPs from favorite artists released this past week. The other is Randy Newman's Dark Matter. The perspectives of Newman, on the one hand, and these two rappers (pictured below) couldn't be more different, in some ways. Newman is an atheist. Mineo and Wordsplayed are Christians. I pray for Newman and enjoy (most of) his music. I pray for these two rappers that God will continue to inspire them, embolden them, and help them to continue as humble servant/artists. To find Magic & Bird, look here. Today is Purple Heart Day. A few minutes ago, Congresswoman Tulsi Gabbard of Hawaii, herself a war veteran, posted this tweet in honor of Purple Heart recipients. Thanks to all who have suffered in military service to our country. God bless you! John Harper was a sort of child prodigy. A Scotsman born in 1872, he came to faith in Jesus Christ at the age of thirteen and within four years, he’d begun getting notice as a convincing preacher with a passion for helping people to know and follow Christ. In 1896, he started a church in London. Beginning with a core of 25 people, thirteen years later, when he left to become pastor of a church in Chicago, the London church had 500 members. In 1912, Harper and his six year old daughter took a trip on the maiden voyage of the HMS Titanic. When the Titanic hit an iceberg and began to sink, John Harper made sure that his little girl got safely onto a lifeboat and then began running up and down all the decks of the ship. He looked for women, children to get onto lifeboats. He also looks for those uncertain about where they would spend eternity, hoping to incite them to throw themselves into the arms of risen, life-giving Jesus. That man was one of only six people plucked out of the water by the packed lifeboats. Harper, on the other hand, at age 40, was one of 1522 people who were left to die that horrible night. But, as we see, at least one of the survivors owed his eternal life to John Harper’s faithful witness. Do you and I have that same passion, that same zeal, for those who are living this life apart from the empowering presence of Jesus? Do we ever give a thought to the thousands of people immediately around us who, day in and day out, try to live life without the lifeboat of Jesus Christ to see them through good and bad times? Do we really care about all those who haven’t sensed that they can call out to Jesus to save them from their sins, from death, from everlasting separation from God? Sometimes, I’m afraid, I’m so bent on just getting through my day and I so desire to “get along” with others, that I allow my passion and my love for my neighbors to be forgotten. I don’t tell them about Jesus. Shame on me for that! Shame on me for lacking the passion of a John Harper! This was the passion with which the writer of today’s second Bible lesson dictated the letter to the first-century church at Rome from which it’s taken. 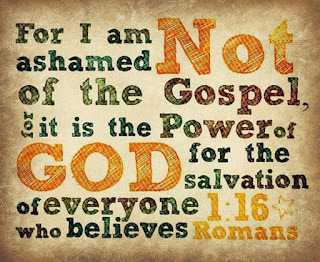 The gospel, the good news of new life for all who repent and believe in the crucified and risen Jesus, this gospel, Paul is saying, is God’s one and only way of changing a person’s eternal destiny from the death and condemnation for which we are ticketed from birth, to eternal life with God. Today’s second lesson, from a later chapter in Romans, finds Paul contemplating his fellow Jews who had rejected Jesus. Contemplating is too tame a word to describe what Paul is doing. Paul really wasn't a tame man. Agonizing is a better way to describe his ruminating about his fellow Jews. It hurt Paul to think of anyone not knowing Jesus and facing the titanic questions of how to live in this world and what will happen to them when they die without Christ at their sides. He dreaded the thought of any one, especially his Jewish kindred, entering a Christ-less eternity! In this passionate passage, Paul was pleading with the non-Jews among the Christian believers in Rome to never forget his fellow Jews. It was the Jews, he said, who first bore testimony about the gracious God Who came to earth in the person of Jesus Christ. They shouldn’t be written off or ignored, Paul argues. They too, need Jesus. As John Harper knew on that fateful night in April, 1912, you and I who follow Jesus Christ are called to live with passion for Christ, anxious to find opportunities to present and live the good news about Jesus, so that none of our neighbors will die condemned for their sin. 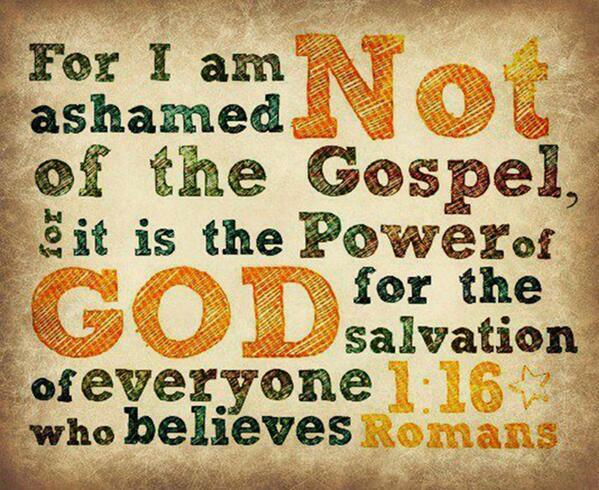 But of course, sharing this good news--this gospel--must be done with the right motives and the right sensitivity. When I was in my teens, a neighbor called me on a Saturday afternoon. It surprised me because the guy rarely had much to do with me. He asked if I was doing anything in the next few hours. Caught by surprise, I said, “No.” He invited me to go with him to see a movie. The title made it sound like a comedy, but turned out to be an evangelistic drama. I might have gone willingly with the guy had his invitation been forthright and honest, even without his deception. But, as it was, I felt like he’d ambushed me. As I sat there in the Ohio Theater in Columbus that day, I was seething with resentment. My neighbor’s sneaky invitation turned me against him and only buttressed my resistance to Jesus. My resentment was heightened after my neighbor tried to high-pressure me once the film was completed and someone had come out onto the stage to issue an evangelistic invitation, into surrendering to Christ as we sat in the theater following the film. When our motive is genuine concern for others though, I have found that people don’t object to our putting in a good word for Christ. I’ve told some of you about what happened one day with one of my favorite seminary professors, Trygve Skarsten. Tryg was the son of Norwegian immigrants and he grew up in New York City, where as a teen, he was a member of a gang. In his late teens though, no doubt as the result of the patient praying and quiet witness of his parents, Tryg gave his life to Christ and went off to college and then seminary. After serving as a pastor for a few years, he went back to New York to get a doctorate in New Testament studies at Columbia University. Every day while enrolled there, Tryg took a bus to Columbia’s campus. During these commutes, he struck up a friendship with a rabbi, also a daily rider on the bus. They enjoyed one another’s company. Tryg was coming close to completing his degree requirements when he asked God to give him the courage to tell his rabbi friend about how important Jesus was in his life and to invite the rabbi to follow Jesus too. On the bus shortly after he'd started praying, Tryg told his friend that he would feel guilty if at some point in their few remaining daily conversations, he didn’t tell him about his own relationship with Jesus, and ask his friend to follow Christ, too. Is Jesus the most important Person in our lives? Is He the most precious thing we have, the best thing we can share with our friends? If Jesus is any of these things to us, let’s ask Him to stir up our zeal for the eternal well-being of our neighbors--all of our neighbors--so that we too, can share with them what is most important to us, what is most precious in all times and in all places: Jesus, the Savior, the Messiah, God-in-the-flesh, our King. Amen!